The Sparkling Hearts Collection is the perfect bedroom collection for young girls. Combining both cottage styling and a sparkling heart theme, this collection can be styled to fit into many different room décor styles. The sparkling heart drawer pulls and accents contain pink glitter sprinkles which gives the collection a fun and unique look. 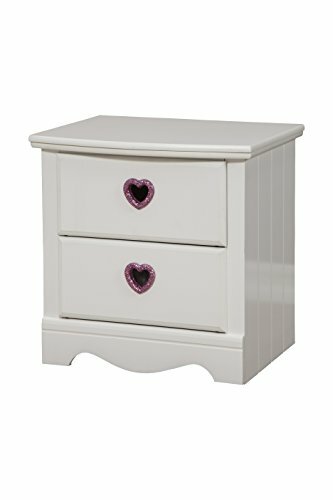 Finished in a mar resistant frost white laminate finish, the two drawer nightstand features roomy drawers with the pink glitter heart drawer pulls allowing for ample storage. Surfboard style bowed tops add another dimension to the look along with the same plank detail found throughout the collection. Additional features include French Dovetail drawer construction, smooth operating steel roller glide drawer runners, and extra sturdy 3 mm MDF case backs and drawer bottoms. Assembled in the USA. Product Materials: MDF, Laminate. Dimensions: Nightstand 22 inches high x 22 inches wide x 18 inches deep.